Club Penguin Cheats by Mimo777 Club Penguin Cheats by Mimo777: Should Club Penguin Super Hero Takeover Return? So how are you liking the party? Club Penguin wants to know if you would like the party to return next year? So, whacha think? Should this party come again next year? There have been a lot of problems. It's just encouraging kids to be mean to other kids. Parents are telling the younger kids they can't go on Club Penguin for 2 weeks, until the superhero stuff is gone. i think they should do it again but less pricey the costumes for members cost like a thousand coins! its not as to fun to non members, i love iron man but i cant even get his mask for free and a citizen isnt as fun we dont get to shoot lasers or help club penguin fight the robot if they made it fair to non members adn made other stuff for the members i would want it again but if its like this time no thank you. I think they should do it again next year but next time GIVE THE CHARACTERS POWERS or at least be able to do something with their costume. Like Spiderman would be able to shoot web from his suit or something like that. I really like there Marvel party, however have not had much free time to play on CP. I think it should return but maybe in Iron man 3 or Thor 2 style. I don't see how parent are banning their kids from playing in the party cause it makes them naughty. It stupid. Superheroes and villains are good for kids to see are watch. Ok maybe DC is not really for young kids as film like Batman are not really for them. but Marvel is for sure. Anyway i would like to see the party return. 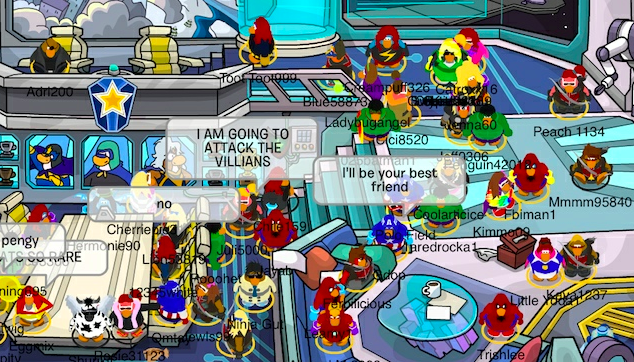 I myself did not like the party and would not like it to return but it's all good fun and it's not like EVERY room is decorated you could visit another room or if your annoyed by people dressed up for the party invite your friends to your igloo. Disney owns Marvel, DC is marvels competition, therefor Disney's competition. I don't forsee a DC party any time in the future. the party id getting boring for me but i do like it though. Also the costumes don't do anything! I spent 3000 coins on the droid costume and it dosen't do anything! They should of just called it "The Superhero Takeover" They could of had the same heros but with Batman, Robin, Superman, and all those other guys! Yep. Cartoon Network owns DC Comics. CN and Disney are already rivals, so I doubt a DC party would come out, but I wish CN had a cool Roleplay game like CP. Heck yeah!!! this party is AWESOME! how long clubpenguin gonna stay this way?